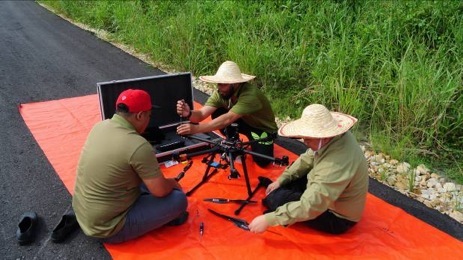 Our partners at the Sarawak Forestry Corporation (SFC) in Lawas, Malaysia are flying drones to survey dugong populations and map seagrass meadows. The crew has logged many hours with their fleet of drones. Flying drones is not as simple as it looks and involves a lot more than manipulating joysticks on a remote control. There are so many variables to consider and many of these can only be discovered through experience. Here our partners discuss their lessons learned. James Anak Bali, a marine biologist, and Toloy Keripin Munsang, a marine environment executive, work for SFC. We spoke extensively with the pair and listened as they shared their experiences. They continue to refine their skills and work toward perfecting their craft to ensure accurate survey data for dugong populations and seagrass cover in Lawas, Malaysia. James and Toloy fly a fleet of three drones including a quad-copter, fixed wing and a fully autonomous hexicopter. Each has its capabilities and considerations. ToloyKeripinMunsang (left) and James Anak Bali (right) work for the Sarawak Forestry Corporation in Lawas, Malaysia. This “Skywalker” fixed-wing drone can fly for two to three hours on a single battery charge. That’s more than other drones, but their payload is considerably smaller. Hexa-Copter (model: Tarot-t810) This drone has six rotors. While it can carry heavier things, its battery life is quite short with only 30 minutes of flying time. The DJi Phantom 4 is small enough to fit in a purpose-built suitcase and is a capable and comparably inexpensive drone. Before we start. Lets do a little test…Can you spot the dugongs? While flying the drones for their surveys, James and Toloy have worked with Conservation Drones () and consulted with specialists, but most of what James and Toloy have learned has been mostly on their own and through trial and error. In speaking with them, we immediately know they love their work. they are are passionate about dugongs and seagrass, and find the process of flying drones intellectually and technologically fascinating. What struck us about them is their willingness to share their knowledge and lessons learned with anyone who will listen. Well…lets listen. Low tide is best for surveying seagrass – with less water, it’s easier to see what’s on the bottom and the drone can pick up exposed seagrass at the intertidal zone. Dugong’s grazing trails can be seen clearly. High tide is best for surveying dugongs. At high tide the dugongs enter shallower areas for feeding on submerged seagrass. The shallower and clearer the water, the easier it is to spot them with a drone. Spring tides are often best for surveys of dugongs and seagrass. Spring tides are the largest tides and occur during new and full moon phases. Spring tides occur 2 times per month and are not related to seasons. Neap tides occur seven days after a new or full moon are often the smallest tides of a lunar cycle. Neap tides are not the best time for either dugong or seagrass surveys. Monsoon season is not a good time to fly a drone. It’s too windy, too wet and the water is too murky. Rain can severely affect the operation of a drone – making it impossible to fly without damaging it. Wind must be at a minimum. No more than 5 meters per second (m/s). High wind drains the battery quickly. Wind can cause riffles on the water making difficult to see into the water and, thus, making wildlife more difficult to spot on the video footage shot by the drone camera. The sun’s rays on the water surface can cause glare. It is best to survey the marine environment when the sun is low on the horizon such as from dawn to mid-morning or afternoon to dusk. Make sure to pay careful attention to altitude when flying a drone. Take into consideration not only the topography of the land, but also the height of the trees. The team recommends flying quad-copter to determine the local topography and the height of trees in the survey area. It’s easier to fly and recover. If does get damaged or loss, it’s less expensive than the other drones. 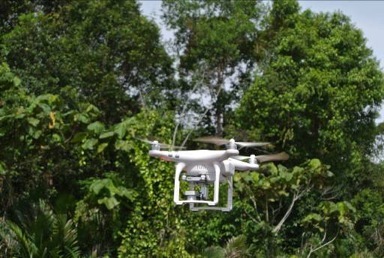 The Sarawak Forestry Corporation team recommends adding 30 meters to the flight plan altitudes when flying over forests. Sixty meters above sea level seems to be the ideal height for wildlife surveys. Flying below that level can scare away the wildlife because of the noise; flying higher reduces the photo resolution, making it harder to see wildlife. Eighty meters above sea level seems to be ideal height for seagrass mapping. That height seems ideal for maximum coverage areas, as well as clear and sharp images. The best speed for both dugong surveys and seagrass mapping is 12 m/s or 43 Kilometer per hour (km/h). When flying a drone Sarawak Forestry Corp team witnessed inquisitive, if not territorial, raptors flying close to the drone. The team hypothesized that the raptors felt threatened by drones. The team uses one drone as a decoy, and subsequently snuck the other drone past the curious raptors. The drone is good at spotting dugongs, sea turtles, schools of fish, birds, seagrass and coral cover. The team also flew the drone over a river to count crocodiles. For seagrass mapping the Canon PowerShot S-100 is able to capture 14Mb geo-tag photos in two-second intervals. Of course different types of cameras have different sized lens attachments. Only use the ones which suit the camera. The team is using free weather (e.g. UAV-Forecast and Windy) and tide (e.g. Annual Tide Tables and Navionics) apps available for Android in the Google Play Store. No flying solo. You need a team for a survey mission. The flight crew consists of a pilot, two technicians and a flight planner/ground commander. Each is assigned tasks and each operates from detailed checklists. This allows each to FOCUS on their tasks. Allocating responsibilities, (hopefully) reduces chance for error. When the drones fly their missions, the team often waits on the ground for it to return. That wait, when flying a fixed wing drone, can be up to 3 hours. In such cases, the team set up a shade structure, chairs, a table, and ate their picnic breakfast while waiting for the return of the drone. When their colleagues drove past, the team was razzed for sitting down on the job! Their advice? Look busy. The team is working in Sarawak, Malaysia, which is very near to Brunei. 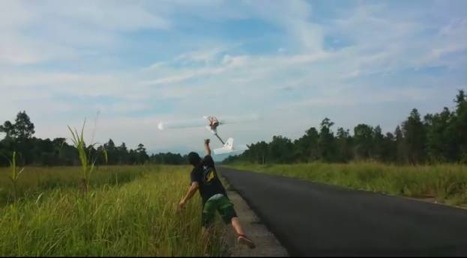 While Malaysia does not restrict drones, Brunei does. The team often had to drive around Brunei to get to the other parts of Malaysia – a drive that often took an extra day of travel, adding to the time and expense of some of their surveys. This news article relates to the project entitled Overcoming knowledge gaps and involving the local community in supporting the establishment of a Marine Protected Area (MPA) for the conservation of dugongs and seagrass in the Bay of Brunei, Lawas, Sarawak, Malaysian Borneo (MY5).. Click below to learn more about this project.